Springtime Hello – Published in Take Ten! I did a post on one of the cards in this magazine, Snowballs 10 cents, back in January of 2016. I love how Take Ten surprises me every now and then by publishing a card that I’ve almost forgotten about! This card brings Springtime to mind with its bright green and orange. It’s super simple to make and of course you can change the colors to your favorites. The swirl stamp is from the Keep Wild set from Unity Stamp Company and the “hello” stamp is from Paper Source. To make the card, stamp the swirl twice with orange ink and once with green ink on white card stock. Punch with a circle punch and layer to green and orange card stock circles using foam tape. Stamp hello with orange ink on white card stock trim and round the corners. Layer 2 different patterned papers to a white card. 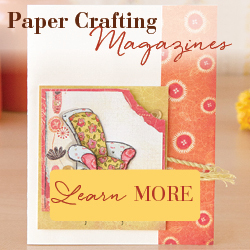 Attach a strip of orange card stock to the middle. Attach the swirl circles to the top of the card. Attach hello to the bottom of the card with foam tape. Add a tiny button to the center of each swirl. Such a simple card, but sure to bring a little Springtime Hello to someone special! 4 Responses to Springtime Hello – Published in Take Ten! Congratulations! Pretty soon you will be able to fill a magazine all by yourself!! Love how simple and versatile this card is. Keep going with adorable creative creations.